The Boulders Safari Camp has been receiving a lot of special attention this year. It has recently been upgraded with an additional room and special features have been added to some of the existing suites, such as a new private pool for Room 1 and a gorgeous new massage deck. Now able to sleep up to 10 people, the camp introduced a 3-night itinerary earlier this year. This allows for visitors to really enjoy the Boulders magic through a carefully crafted itinerary that brings guests closer to nature and the stunning beauty of the southern part of the NamibRand Nature Reserve. In addition, guests’ arrivals are coordinated to Mondays and Thursdays weekly, making it easy for us to satisfy every element of the itinerary with ease. 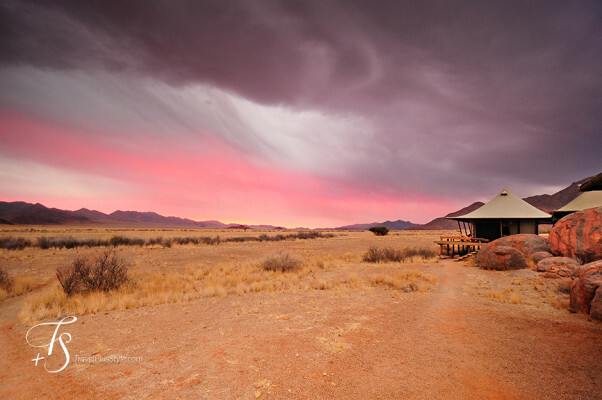 Boulders Safari Camp is situated in one of the most visually stunning parts of the Reserve. Dotted with ancient mammoth granite Boulders, there is a vast and stark difference in the scenery of these parts and this also creates some unique opportunities for special outdoor dining locations. The itinerary is delicately crafted to offer a balance between activity, adventure, and relaxation. Guests of Boulders Safari Camp are treated to the perfect Wolwedans desert safari experience which brings together the soul rejuvenating stillness of the uncluttered desertscape with relaxing activities designed to encourage active participation and promote a healthy digital detox. Day 1: Upon your arrival before noon your guide or camp manager will check you in and brief you on your new home away from home. Lunch is followed by an afternoon activity such as e-biking, a scenic drive or a nature walk. 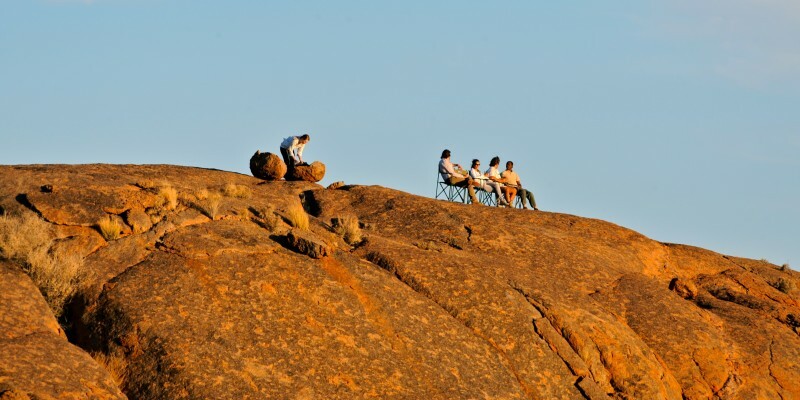 As the sun begins its descent, sundowners will be served on top of a granite boulder with a stunning view of the expansive plains and age-old mountains. Take a little time to freshen up before enjoying dinner in the company of the other guests. Be prepared for an incredible night sky to wrap up your evening. Day 2: Start early in the morning with a San (Bushman) walk in the serenity of the Namib Desert. Brunch is served in the lap of nature. Return to camp for a well-deserved siesta and don’t be surprised if it turns into the deepest sleep you ever experienced. Or opt for an equally revitalizing massage or beauty treatment. Later in the afternoon, you are taken on an extended scenic drive to explore further – and to your next magnificent sundowner setting. Back at the camp, a dinner experience celebrating the desert awaits. Day 3: Set off on a day-safari to Wolwedans to see the dramatic differences in colour and texture between the southern and northern parts of NamibRand Nature Reserve as described in many a guidebook. Granite boulders and rocky mountainous landscapes melt into red sand dunes dotted with camel thorn trees. Keep an eye out for desert-adapted giraffe, springbok, hartebeest, zebra, oryx, and ostrich. Ask your guide about some of the nocturnal predators that share the reserve with their prey. At Wolwedans you will sit down to lunch, followed by an inspiring back of house tour of the Wolwedans Village. You will be amazed at the complex systems which run our ecologically sustainable desert-based activities. 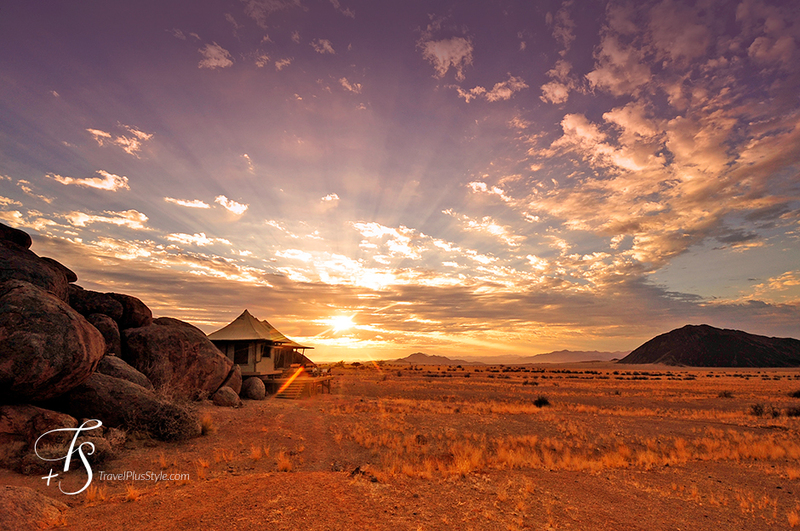 You return to Boulders Safari Camp mid-afternoon, providing perfect photo opportunities in the afternoon sun. After your sun-downer be ready for a surprise, once-in-a-lifetime dining experience. Day 4: The morning of your departure! Check-out is at 10:00, after a relaxed breakfast. Remember to visit the small curio shop for gifts and souvenirs before your departure. 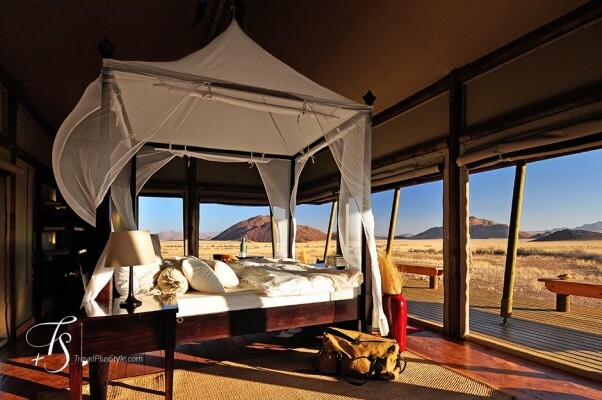 With only the best in hospitality, unparalleled tranquility and natures purest pamper, Boulders Safari Camp is the perfect desert safari which guests will want to come back and re-discover time and time again.